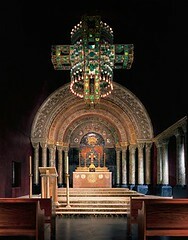 The massive cross-shaped “electrolier” in Tiffany’s chapel is one of its most powerful elements. Weighing approximately 1,000 pounds and measuring 10 feet in height, this lighting fixture is comprised of cast metal and green turtleback glass. This reconstructed chapel was featured at the 1893 World’s Fair Exibition. This is only one of the magnificiant exhibits awaiting your visit!